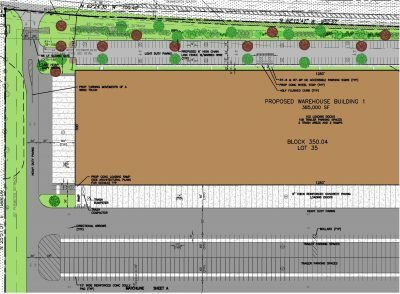 West Deptford Township, Gloucester County, NJ CES was chosen to provide full engineering services for this project that includes two proposed warehouse distribution buildings, each having 385,000 square feet for a total of 770,000 square feet. The project is located on an industrial stretch between COIM USA and a large solar energy complex. It was formerly the Huntsman Polypropylene Site. The project had difficult county road engineering issues and New Jersey Department of Environmental Protection issues. The project should be ready for construction in the near future as a great new ratable for the township.